Hookworm - body, causes, What Is Hookworm?, How Do Hookworms Grow? Hookworm is a parasitic roundworm that burrows through the skin, moves through the bloodstream to the lungs, and finally moves into the intestinal tract. * parasitic (para-SIT-ik) refers to creatures that live in and feed on the bodies of other organisms. * hosts are the animals or plants that harbor a parasite. Hookworm is a type of parasitic * roundworm, known as a nematode (NEM-a-tode), that has hooked mouthparts. The worm uses these mouthparts to fasten itself onto the intestinal walls of various hosts * , including humans. Hookworm larvae (the stage between egg and adult) often enter the body through the skin between the toes in people who go barefoot. Hookworm affects about a quarter of the world's population, most often in warm, moist areas and in places with poor sanitation. Adult hookworms live inside the small intestine of humans and other animals, where they attach to the intestinal wall and feed on the host's blood. Eggs are passed in the host's stools. The eggs hatch into larvae in 1 to 2 days under warm, moist conditions out of direct sunlight. The larvae grow in the stools and/or soil for 5 to 10 days until they become filariform (fi-LARE-i-form), or threadlike. It is during this stage that hookworm can cause infection. Charles Stiles started the National Hookworm Eradication Program in the early 1900s. At the time, hookworm was a serious problem in the southern United States because of the warm, moist climate and poor sanitation conditions, combined with the habit of going barefoot. Hookworm was called the "germ of laziness." In 1914, oil magnate John D. Rockefeller gave Stiles a $1 million grant to target sanitation in the public schools. Stiles's program became a model used in hookworm eradication programs worldwide. Approximately 3.5 billion people world-wide have some form of infection from intestinal parasites, with about 450 million people in rich and poor countries alike experiencing symptoms of illness. Hookworms, roundworms, and pin-worms are among the most common intestinal parasites and are a major public health problem. Children living in poor regions with tropical climates are especially at risk for hookworm and roundworm infections. Hookworm and roundworm infections also occur in countries like the United States, especially from contact with infected pets or their waste or from poor personal hygiene. Hookworms are responsible for 60,000 deaths annually. The large roundworm Ascaris lumbricoides (which causes ascariasis) is responsible for another 65,000 deaths worldwide each year. 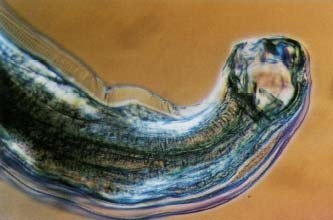 The parasitic hookworm Necator ameri-canus uses its hooked mouthpart to attach to the intestinal wall. © (A. M. Siegelman/Visuals Unlimited. to the throat, where they are swallowed. They then pass down the digestive tract to the small intestine. Inside the small intestine, they attach to the intestinal wall, and the cycle begins again. How Is Hookworm Diagnosed and Treated? The most common symptom of hookworm is anemia * caused by a loss of iron due to blood loss. Other symptoms include lack of appetite, weight loss, diarrhea * , and vague abdominal pain. When the larvae are in the lungs, there may be a dry cough and a mild fever. When the larvae burrow into the skin, there may be mild itching and a rash. It is not uncommon, however, for mild infections to show no symptoms at all. An infection is confirmed in the laboratory by observing eggs in stool samples under a microscope. Medications can be prescribed to treat the infection. Anemia is treated with iron supplements. The most effective method of prevention is limiting direct contact between infected soil and skin. In areas where hookworm is common, people should avoid walking barefoot or touching soil with their bare hands. * anemia (a-NEE-mee-a) results when people have too few red blood cells and hemoglobin to carry oxygen in the blood. * diarrhea (di-a-REE-a) refers to large, frequent, watery stools (bowel movements). U.S. Centers for Disease Control and Prevention (CDC), 1600 Clifton Road, Atlanta, GA 30333. CDC has a Division of Parasitic Diseases that posts a fact sheet about hookworm infection at its website. U.S. National Institute of Allergy and Infectious Diseases (NIAID). NIAID posts a fact sheet about hookworm and other parasitic round-worm diseases at its website.